LIONEL PODCAST: The Singular Worst Moment in American Marketing. But Enough About Chevy Chase’s Talk Show. Behold the nadir in American marketing genius. I rarely quote Wikipedia but will make an exception here. New Coke was the reformulation of Coca-Cola introduced in 1985 by The Coca-Cola Company to replace the original formula of its flagship soft drink, Coca-Cola (also called Coke). 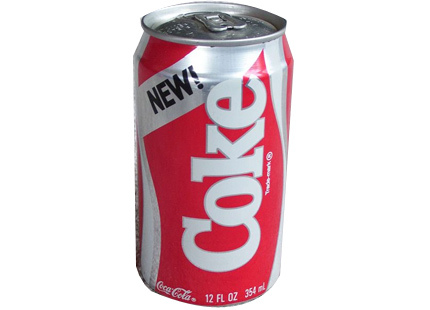 New Coke originally had no separate name of its own, but was simply known as “the new taste of Coca-Cola” until 1992 when it was renamed Coca-Cola II. The American public’s reaction to the change was negative and the new cola was a major marketing failure. The moment of idiocy forever changed my life. Much like the first time I saw Ernie Lee, but that’s another story. It showed me that sometimes the greatest so-called marketing geniuses make the most inconceivably bone-headed moves when it comes to marketing and advertising. They either ignore or never quite got the obvious. Herein inter alia is my take on such. Watch the concern serialized. And in the mean time, pick a topic. Any topic.